This most interesting surname is of Anglo-Saxon origin, and is a topographical name for "a dweller in the brushwood", derived from the Olde English pre 7th century elements "haess", brushwood, and "mann", man; hence "man from the brushwood". The surname may also have originated from the medieval given name "Hay", from the Olde English nickname "Heah", meaning tall, with "mann", which in this case means "servant of", or "Heah's man". The Olde English "haes", is also found in the placenames Hayes (Kent and Middlesex), Hays (Sussex), Heaseland, and Heasewood Farm (Sussex). Topographical surnames were among the earliest created, since both natural and man-made features in the landscape provided easily recognisable distinguishing names in the small communities of the Middle Ages. Variants of the surname in the modern idiom include Heaseman, Hayesman, Easman and Atheis. 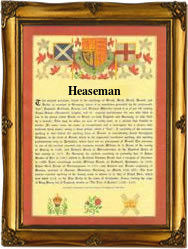 Hayesman and Easeman are both found in Kent. Hugh de la Heise is recorded in 1197, in the Eynsham Cartulary (Oxford). William son of Henery and Ann Heasman, was christened on April 20th, 1698 at St. Paul's, Convent Garden, Westminster, London. The first recorded spelling of the family name is shown to be that of Simon le Heysman, which was dated 1275, in the "Hundred Rolls of Norfolk", during the reign of King Edward 1, known as "The Hammer of the Scots", 1272 - 1307. Surnames became necessary when governments introduced personal taxation. In England this was known as Poll Tax. Throughout the centuries, surnames in every country have continued to "develop" often leading to astonishing variants of the original spelling.